Two simple ways you can support St. Rita! St. Rita is part of the Community Kroger Rewards program. You help us earn cash when you make purchases using your Kroger Plus Card. It's easy to register at: kroger.com/account/enrollcommunityrewardsnow. Our Kroger code is JK186 and you will need that number when you register your card. Anyone can register their Kroger Plus Card for St. Rita to receive the benefits. Make sure to share the code with family and friends! 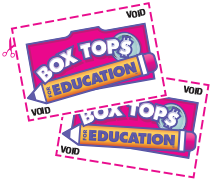 Please collect your Box Tops and send them to the front office. Our students will take it from there! They will have the opportunity to count them and send them in for cash for the Transition to Work Career program.